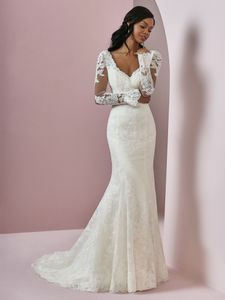 Description: A unique take on the sleeved wedding gown, this tulle fit-and-flare features illusion bell sleeves accented in lace motifs. Soft lace motifs adorn the bodice, illusion V-neckline, and illusion scoop back. Finished with covered buttons and zipper closure.